By the 1970s, Finland had produced a number of interesting academic and avant-garde electronic music pieces, ranging from the electronic études of Bengt Johansson to M.A. Numminen's ear-razing experiments with digital-synthesizer pioneer Erkki Kurenniemi's "electric quartet". 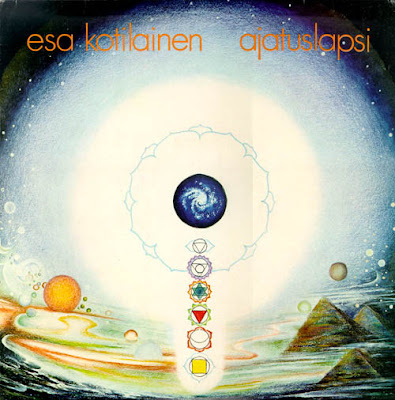 However, it was keyboard wizard Esa Kotilainen's Ajatuslapsi (LP Love Records LRLP 196) that really spearheaded the emergence of rock-oriented, Berlin-school synth music in the country. You can hear this on the album's centrepiece, the suite "Unisalissa" (In the Dream Hall) that spans its A-side. A few minutes into the piece, the harmony settles on to a single droning organ chord, over which a synthesizer slowly draws four-note melodic fragments that shine as incessantly as any mentally-disturbed jewel. Soon we have multiple synthesizer ostinati echoing across the Rubycon while the spooky organ and string-synthesizer's melodies prophesy a Phaedra-like tragedy. However, Kotilainen next goes beyond this familiar German space: most of the rest of the suite is taken up by a corrosive, Arabic-modal organ solo over the ominously trudging, buzzing and trilling synthesizer accompaniment. And as if to balance the electronic darkness of the piece, the brief coda has accordion playing a frostily folky melody, backed by that most Finnish of instruments, the kantele. On the B-side, "Avartuva nδkemys" (A Widening Perspective) is more an intricate sound-effect narrative than a fully engaging musical composition, but "Ilmassa" ("In the Air") is another hugely effective synthesizer meditation over a single organ chord. Kotilainen's work may lack Klaus Schulze's Wagnerian monumentalism or Tangerine Dream's atmospheric profundity. Instead its homespun production values, its modest instrumentation and its subtle folkloristic touches make it sound quite refreshing within a musical style that later has been followed, imitated, copied, remixed and sampled nearly to death with all the state-of-the-art electronic instrumentation modern technology has produced. It is derivative yet different enough to be interesting, if not earthshaking. Love Records' successor Siboney has been promising a CD re-release for years, but at the beginning of 2005 those were still just promises. In addition to his prolific studio works and collaborations with the Lapp artist and author Nils-Aslak Valkeapää, Kotilainen has played with many Finnish progressive rock artists, including Wigwam and Jukka Tolonen. At one time he was the sole owner of a working Mellotron in the country. The white beast makes an appearance on his 1995 solo album Aamu joella - Morning by the River, but this album is more a showcase for his accordion and more about folk music than anything else. From 1999 on he has been the regular keyboard player for the reformed Wigwam. One of the 70s milestones in electronic music. Hi, excellent lp, thanks very much! I was wondering if you have "plot zero" by Trans Millenia Consort?, hard to find and it would sit nicely on the mutant sounds blog! Amazing stuff - thanks for the terrific post! Woohoo! Berlin School that I am unfamiliar with - from Finland no less! I am excited to hear this. thanks a lot for this and all the other truly wonderful music. Man, this is wonderful. Thank you much! thank you for the obscure gem from times past... it never ceases to amaze me how much great music is still left to explore without having to play a single new note. Anyone know where the Australian artist Cybotron can be found? This is indeed a wonderful album, which I found in the remainder bin in about 1980. I still have the vinyl record in my collection. The cover first caught my eye, with its spacy, New Age depiction of the seven chakras or energy centers of the human body. And apparently, it was reissued on Love Records in 2008 as LRCD 196. It's well worth listening to Ajatuslapsi. If you prefer to have a little structure, a rhythm or a melody here and there, then this record can be mighty boring. The beginning is clearly an attempt to do something like Pink Floyd's intro to "Shine On You Crazy Diamond", and what follows is only "sound". Thank you anyway for sharing all these treasures from the past!